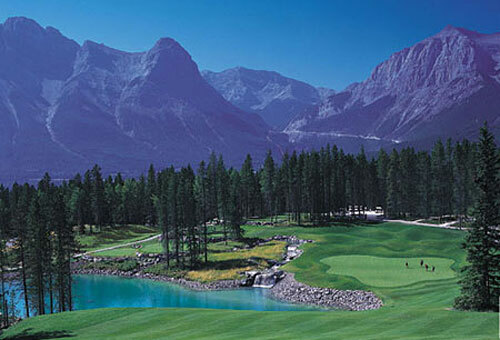 Jasper, Alberta and Banff, Alberta offer great examples of golfing in the Canadian Rockies--a unique blend of challenging courses and beautiful scenery. JASPER and BANFF, ALBERTA-Canada-Trying to understand what a vacation or lifestyle destination is like from the outside looking in can be difficult. And informed decisions can mean the difference between wishing for a great getaway experience and ensuring one. Here are the precise reasons why each of these descriptive words were selected by this group, which includes Stewart Creek Golf and Country Club, The Fairmont Jasper Park Lodge, Kananaskis Country Golf Course, Canmore Golf & Curling Club, Silvertip Resort, and The Fairmont Banff Springs. With two revered, classical era golf course designs by Stanley Thompson – at Banff Springs and Jasper Park – two Robert Trent Jones Sr. masterpieces at Kananaskis Country Golf Course, and The Fairmont Banff Springs – which is styled after a Scottish baronial castle and built in the late 19th Century – the destination is a tribute to elegant, timeless designs from a bygone era. Yet it offers all the modern conveniences and amenities, but without overdevelopment thanks to being located in either federal parks (the two Fairmont resorts) or an idyllic, rural oasis (Kananaskis Country). The Fairmont Banff Springs is a 1st Class resort with 1st Class services and amenities. Had a fantastic time. Thank you all very much! – Brian M. -LENEXA, KS. All six of the courses in the area – with a combined 135 holes and an additional new 18 soon to arrive along side Stewart Creek – are decorated by towering, majestic mountain peaks which are so close they seem within arm’s reach. Distraction by natural wonder is a distinct reality when playing golf in the Canadian Rockies. Silvertip and Stewart Creek not only offer great drama in their course designs, which wind up and down and around the stunning terrain, but also are preferred sites for weddings and corporate retreats. They also are popular vacation- and/or second-home destinations, thanks to the aforementioned scintillating vistas and locations of the resorts, combined with their many upscale amenities. Thanks to the thousands upon thousands of protected acres which fall under the national parks and which are the core of the Canadian Rockies golf and resort lifestyle experience, wildlife proliferates. It is common to see 800-pound elk with massive racks atop their head meandering throughout the area, including occasionally asking to play through. Jasper Park is particularly graced with an abundance of animals throughout the park. There’s a reason they call it “the wild side of the Rockies”, and bear, coyote, cougars, and a wide variety of birds including eagles are regularly sighted. Furthermore, virtually all of the Canadian Rockies consortium golf courses are honored members of the Audubon Sanctuary program which promotes and recognizes properties which employ best environmental practices. Nature and golf are only a couple of the many acclaimed attractions offered in the Canadian Rockies (the golf courses are routinely bestowed with best-of accolades). Other amenities include Banff Springs’ Willow Stream Spa, which is 38,000 square feet of award-winning opulence and myriad soul-soothing services. Or Jasper Park is the perfect resort choice for families or corporate retreats thanks to a plethora of standalone accommodation choices including luxury cabins with casually elegant common areas and full kitchens combined with individual, hotel-style rooms for privacy. Canmore Golf & Curling Club is a delightful club with a vibe like that of the TV sitcom “Cheers,” where everybody knows your name and you’re welcomed like an old friend. Golf course architect Les Furber, who also designed Silvertip Resort, is a member. How many courses can you play where the course is constantly being tweaked by a talented, well-regarded design expert? Combine the spectacular scenery and summer daylight as late as 11:00 p.m. and golfers can play to their heart’s delight and still have time for family and the region’s many other activities. These include helicopter tours, hiking, fishing, rafting, gourmet restaurants, indoor and outdoor pools, horseback riding, and many children’s programs. This area – host to the 1988 Olympic Games in Alberta – has long been known to avid travelers and winter-sport aficionados for its awe-inspiring terrain and jaw-dropping scenery. Winter activities run the gamut from skiing, ice climbing, dog-sledding, snowshoeing, ice fishing, horse-drawn carriage rides, hockey, ice-skating and much more. For icing on the cake all of the properties are close to one another – from 5 to 45 minutes – except Jasper Park. It’s a three-hour drive from Banff Springs, but such a description would be decried by many. Traversed along the Icefields Parkway, many consider this mind-blowing drive among the world’s most scintillating, thanks to the panoramic, otherworldly natural environs, which include glaciers, pine forests blanketing craggy slopes, and everpresent snow-capped peaks which can rise as high as 12,000 feet from the roughly mile-high base on which most of the area sits. To view the stunning topography, vacation options and learn more about the area visit www.canadianrockiesgolf.ca. Website visitors can view stay-and-play packages or request custom quotes for trips and packages. And for all your Canadian Rockies travel needs, be sure to check out BanffTravel.com and JasperVacations.com, which offer great information and planning advice to make the most out of your time in the Rocky Mountains. My son and I thoroughly enjoyed every minute of our stay and play at The Fairmont Jasper Park Lodge (the crown jewel of the Rocky mountains) and Chris and Gord @ Golf Canada’s West were awesome to deal with. We’ll be calling you again for sure-many thanks. – Pat M. – EDMONTON, AB.